Diabetes is a lifelong disease. It cannot be cured, but it can be managed. However, if a person is diagnosed with prediabetes, it CAN prevent diabetes. In such an early stage, you should make whatever lifestyle and diet changes it takes to prevent reaching the diabetes threshold. Healthy eating can help you maintain balanced blood glucose levels and an optimal weight. Some of the best herbs for blood glucose control include bitter melon (ampalaya), turmeric, river spinach, moringa, and banaba. In this article, you’ll learn how to use ampalaya or bitter melon to help balance your blood glucose levels. Researchers in China, Australia, and Germany discovered that bitter melon has 4 compounds which activate the enzyme responsible for transporting blood sugar from the blood to the cells. It’s the same enzyme as the one activated by exercise, called AMPK. Even though more human studies are needed to confirm the beneficial effects of bitter melon on blood glucose levels, you lose nothing for trying it out. Turn your bitter melon into a nice, refreshing juice by mixing it with some lemon (or pineapple) and water in a blender. Mix until you get a nice consistency. Then, strain the liquid and drink immediately. If you choose to use pineapple instead of lemon use it in moderate amount since it’s very sweet. 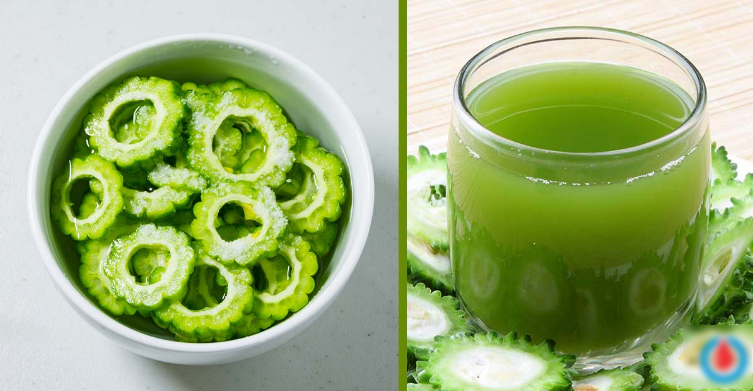 This drink will help control your blood sugar levels so you can use it regularly.